The Sumerians made lots of innovations, or new technological advancements. One of which is the wheel. It allowed them to make war chariot and coins. Some other innovations are the wheeled cart, which allowed animals to pull the cart to make trade much easier. 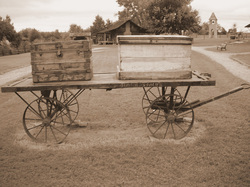 The wheeled cart allowed people to move from place to place faster, they also could trade easier, but that made them a huge target for thugs and criminals.